The .243 Winchester round, also referred to as 6x52mm in metric, is a popular sporting rifle round produced by Winchester originally in 1955. Originally, the 243 round was intended as a varmint/target round, being ideal for game such as deer, wild hogs, and coyotes. It is important to keep in mind that 243 rounds less than 90 grains are more suited for varmints, where rounds greater than 90 grains are more suited for the larger game mentioned above. 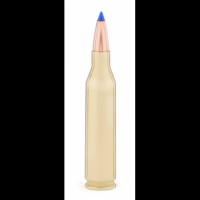 The .243 Winchester round is derived from a necked down .308 cartridge case, making it popular for target shooters and long range shooters alike due to its accuracy and low recoil.